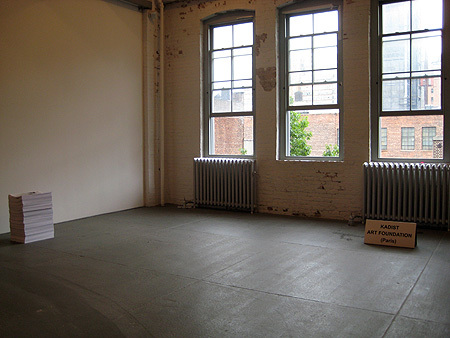 A couple of weeks ago, the X-initiative in New York City organized “No Soul for Sale: A Festival of Independents,” bringing to its galleries —in the former Dia building on 22nd Street in Chelsea— dozens of international independent art spaces and American nonprofit organizations devoted to contemporary art. Kadist Art Foundation from Paris was one of the participants. Having done a curatorial residency there last year, they enlisted me to organize their presentation at X’s week-long and event-filled exhibition. I’ve posted some photographs of the installation in Flickr. At Kadist’s designated space at X was a single artwork, Awaiting Enacted by Roman Ondák, a 16-page newspaper composed of various articles in different languages fully illustrated with images of people queuing. This is one of several artworks by Ondák in Kadist’s collection, not unrelated to his performance, Good Feelings in Good Times, where people, simply, queue. Read an article by Max Andrews about this work at Tate, etc. “No Soul for Sale: A Festival of Independents” is closed, but if you’re in New York you can experience another of Ondák’s works. As part of their performance series, The Museum of Modern Art is currently showing his Measuring the Universe, whereby participating visitors names and height are penciled on the gallery walls. Considering the hundreds of visitors MoMA has daily, the etchings promise a quite diverse yet minimal portrait of its public. Above, installation view of Roman Ondák’s work at Kadist Art Foundation’s space at X-initiatve. Special thanks to Jose García.